The first dolls came with a wearable towel and nappy. In 1989 Ideal was taken over by Tyco and Rub a Dub dolly was redesigned and re-released looking slightly different and wearing different clothing. ''Soap her and suds her and then you will see. See how much fun a bath can be''. This doll was produced in 1975 and the doll head was made in Hong Kong. The back of her body and head are marked with 1973, and she is approx. 44cm tall. She is wearing her original pants (or nappy)with a towel with a hood on it. The towel has a little wear to it but it is over 40 years old. The box is in reasonable condition but also shows a little wear. Rub a dub dolly has great colour all over her body, with blue transfer painted open eyes. She is jointed at the neck, arms and legs. Her short blond hair is rooted, and is a little dry, but still a good cover. A wonderful toy of the era. This is an accessory for the doll Rub a dub dolly. 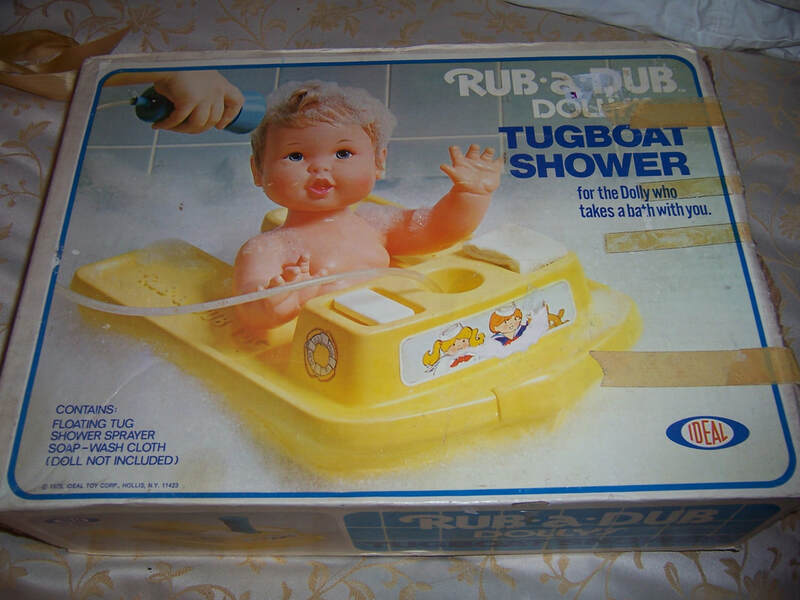 It is her Tug boat shower in its original box. It is complete except for her soap and washcloth which can be easily replaced. The yellow plastic tug boat fits around her and allows her to float. There is also a shower sprayer which I have not tested but all the parts are there. There is no doll just the boat with the shower. The box is in good condition for its age with old tape on it. 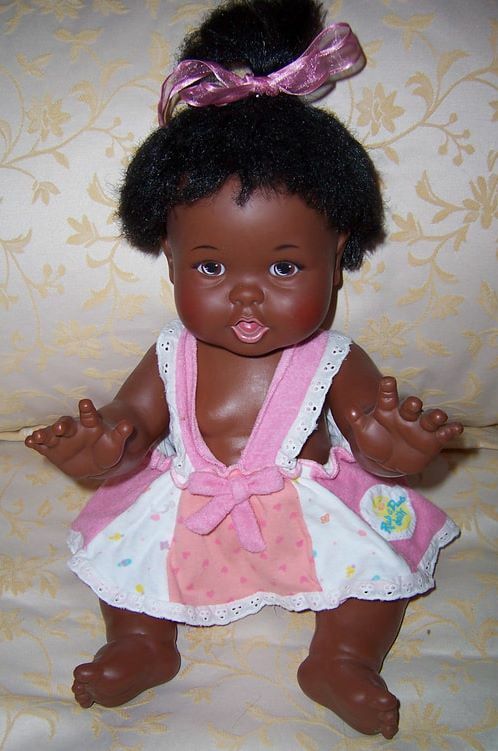 This doll is the black version of Rub a dub dolly. She has 1973 on her neck and back. She is wearing an original Rub a dub dolly outfit but it is from the later version of the doll. It still fits her and looks like a dress at the front but it is actually a little sun terry towelling type fabric outfit. She is the same size as her white sister - 44cm tall approx. Her hair is a little dry like her sisters, and again is a good cover.